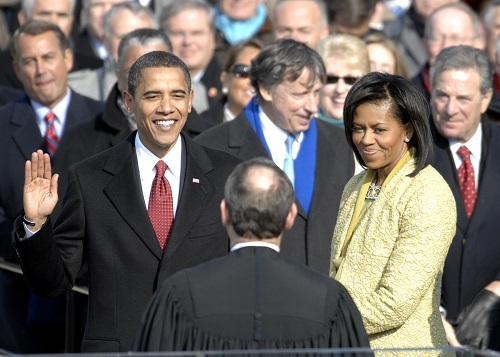 WASHINGTON – Want to be part of history as Barack Obama takes the presidential oath on the steps of the Capitol? Start planning now. The inauguration of Obama at noon on Jan. 20 will draw huge crowds to the nation’s capital. Details of the festivities are still evolving, but here’s what you need to know now, if you’re contemplating the trip. Obama will be sworn in on the West Front of the Capitol facing the National Mall. Tickets are free from House members and senators. Be warned: Demand is high. Carole Florman, spokeswoman for the Joint Congressional Committee on Inaugural Ceremonies, said 240,000 tickets for seats at the swearing-in ceremony will be handed out to members of Congress and the yet-to-be-formed Presidential Inaugural Committee. Disbursement of the free tickets hasn’t been worked out yet, but senators generally get more because they represent entire states. Senate and House members typically give tickets to people who live in their states or districts, and the tickets must be picked up in person in Washington. “We won’t be able to accommodate as many people as we’d like,” Florman warned. The earliest requests came in almost a year ago and members of Congress from both parties have been inundated since the election. “It grows every day,” said Chris Walker, a spokesman for Sen. Richard Burr, R-N.C., whose office has received requests for 6,000 tickets. Many congressional offices said they are taking requests first-come, first-served and it will be hard to accommodate all. The office of Sen. Jim Webb, D-Va., has had 15,000 ticket requests for the swearing in. In the past, the office has received about 500 tickets. The ticketed seats will extend to the edge of Fourth Street and the National Mall. Behind that area, the Presidential Inaugural Committee will set up a standing-room area that will require tickets. Details are to come. Space for the news media and a staging area for the parade will be on the National Mall. Beyond those areas, space will likely be open to the public, free and without tickets, said Bill Line, a spokesman for the National Park Service. The Presidential Inaugural Committee, to be formed later this month, will make those decisions. In the past, large screens have been set up along the National Mall for visitors to watch the ceremony. Typically, tickets are not required for most of the parade route along Pennsylvania Avenue, starting at the Capitol and ending at the White House. Space is available on a first-come, first-served basis. Visibility will be limited because of large crowds and tight security. Marching bands, marching units, mounted units and other performers may still be able to participate in the parade if the apply by 5 p.m. Friday. For more information and to apply, visit www.afic.northcom.mil. Don’t buy it, Florman said. The tickets are free – and they aren’t even handed out until a week before the inauguration. “Anyone who claims that they have tickets simply isn’t telling the truth,” she said. Unfortunately, Florman said, legitimate tickets are likely to be scalped once people do have the tickets in hand. Want to party like it’s 2009? Inaugural balls will occur between Jan. 15 and Jan. 20. The official balls are organized by the Presidential Inaugural Committee, but many states and other organizations host balls as well. Some state societies are beginning to release information on how to purchase tickets. Visit the National Conference of State Societies for information. The Presidential Inaugural Committee will plan other inaugural festivities. Those events are paid through private fundraisers or at a cost to attendees. Hotel rates are changing by the minute. Many hotels are requiring minimum stays, typically three to five nights, as well as pre-payment. Many chain hotels are already sold out in the Washington area, as are some in Baltimore, 40 miles away. Marriott hotels in the Washington region were nearly all booked Monday. A handful of rooms was still available in the Maryland suburbs, but required minimum four-night stays with rates ranging from $449 to $599 for three of the four nights. There are other options. Many in the Washington area are renting out their apartments through online ads like craigslist.org. As of Monday, more than 1,300 ads were posted by Washingtonians offering their homes for high fees and by out-of-towners looking for lodging. If you feel like blowing the equivalent of buying a couple of new cars, some swanky hotels are offering luxury package deals. The Ritz-Carlton in Georgetown has a package for $99,000 that includes airline tickets, a four-night stay in the Presidential Suite, a 24-hour chauffeur and a host of other perks. Getting to the nation’s capital may also be pricy. Airline ticket prices are already climbing and will go higher as Jan. 20 approaches. Travel agents advise booking flights as soon as possible. Airlines are reporting a jump in ticketing around the inauguration to the Washington region’s three airports – Reagan National, Dulles and Baltimore-Washington International. Bookings at Delta Air Lines for flights to the three area airports from Jan. 16 to Jan. 19 are up 200 percent from the same time last year, said Susan Chana Elliott, a spokeswoman for Delta. Many groups are also chartering luxury buses, said Ken Presley, vice president of industry relations for the United Motorcoach Association. Carriers east of the Mississippi River all report jumps in reservations. Many groups plan to come to Washington just for the day and go home that night or stay far outside the region. Presley said most carriers still have motor coaches available, but supply is dwindling. He recommends that travelers visit busrates.com. Rental cars are still available at reasonable prices, but that’s partly because Washington is walkable, has an easy-to-use public transit system and limited parking. Avoid sitting in Washington’s notorious gridlock by taking the Metro or buses. Want a car and a driver for the inaugural ball? Limousine companies said calls started increasing last week and they expect to be booked by the end of the month. Prepare to bundle up. January is Washington’s coldest month. The average high for January is 42 degrees and the average low is 27 degrees. And there’s always the possibility of snow.